A Digital Tick or cross consumer? Sony's head of corporate affairs in the UK has questioned the relevance of the Digital Tick – used to indicate to consumers what equipment in a shop is ready for the digital switchover. Adrian Northover-Smith, speaking at the Westminster eForum, explained that a recent shopping trip has left him questioning the point of having Digital UK's tick when nearly all equipment is ready for digital. "I went into a store recently and it was interesting to walk around the TV section," said Northover-Smith. "And in the set-top box section there was no digital tick either. 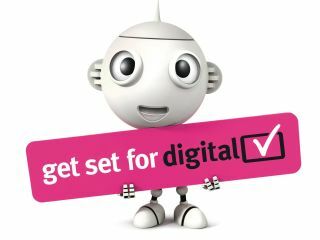 The only place you could find the digital tick was on the boxes of the manufacturers' set-top boxes and PVRs. "So we've kind of moved on already and you have to question the relevance of the Digital Tick now." However, Alex Lane the editor of What Satellite – part of the TechRadar network – believes that there is still value in the Tick. "The Digital Tick provides reassurance for consumers that manufacturers are not playing fast and loose with the basic technical standards that have made Digital Switchover a success – standards that will be just as essential after switchover," said Lane.